This two day course consists of 4 x 2 hour sessions and observed practice time, no previous experience is required. 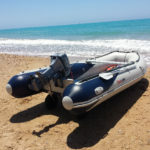 This course introduces you to the fundamentals of windsurfing and by the end of the weekend you should be able to sail to a chosen point on the water and return to where you started. The Start Windsurfing course, begins with a session on the land-based simulator before getting you afloat and well on your way to up and sailing. The course covers the following, rig handling, balance, basic stance, sailing across the wind and turning the board. 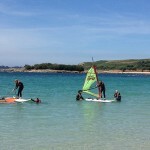 This is the first course in the RYA windsurfing Scheme.